I am a ticketed carpenter and a ticketed log builder. I believe that if you build with wood you must protect it. I believe that Perma-Chink provides you with the best line of products to do so. They are environmentally friendly and if you apply them as they recommend then they will perform as you expect them to. I use only Perma-Chink products and I recommend you do so as well! Brenda and I bought a log home in Challis, Idaho in 2015. This home was built in 1980. As with most homes built in this era it was very dark which made it outdated for the present era. We saw the potential this home had, we just needed a lot of advice on how to get it there. After careful review of several companies and their products we chose Perma-Chink. I was informed from a good source that builds log homes that Joanne Hamlin with Perma-Chink could help us out with whatever we needed. Boy were they right! I called Perma-Chink for the first time and got hooked up with Joanne. She has been so kind, sweet, considerate, educational, so helpful on how to, what product to use, and how to apply it. Guidance in all areas has just been wonderful experience. Look forward to all future business with Perm-Chink. Jimmy, thank you for your excellent, courteous and well informed communication. You were able to work with a very unique situation in a very respectful way, and I appreciate that. I would say that Perma-Chink is lucky to have you in their Customer Care Department! Hi Greg! 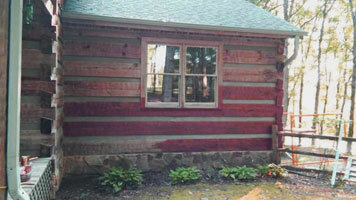 I wanted to thank you for your patience and the assistance you provided regarding staining our log home. Your guidance was extremely helpful. It's people like you who make it a pleasure doing business with Perma-Chink Systems. 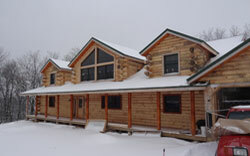 Since 2001 I've been blessed to be able to build log homes. Perma-Chink products have enhanced this fun, adding security in quality products and aesthetics in the beauty of your true colors. Integrity and reliability are cornerstones of your products. Thank you Greg and Perma-Chink! 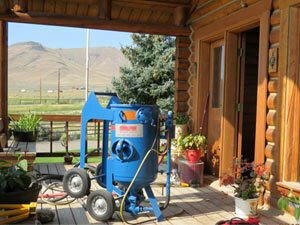 I have been using Perma-Chink products on my century old log cabins and on my newly constructed cabins for 20 years. I cannot say enough about it. The product holds up for what seems forever, and mice and squirrels detest it. The seal the chinking creates has made my old drafty cabins as tight as new ones, making them easy to heat during cold Maine winters. I use the Log Boss screws for attaching logs when I build with vertical logs. I have also been happy with the Ultra-7 stain and Advance topcoat. All-in-all, great products from a great company! Everything worked out great and we appreciate all of your help, Greg! Perma-Chink products are the best! 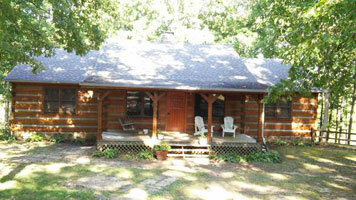 I have included a picture of the exterior and interior. Perma-Chink’s customer service provided by Billy Cash and Jimmy Kennedy has been outstanding, and the products are excellent. We are a new build and have used all Perma-Chink products on our exterior as well as interior throughout our build and are very well please with the application and performance. We have personally done all work on staining and sealing since being jilted by a contractor, so we are pleased to have Perma-Chink by our side throughout this process! Late yesterday (Monday) afternoon I called and placed an order for a case of Perma-Chink and a gallon of Log Wash through Aaron. I wasn’t expecting the order until Wednesday - optimistically - and maybe later. I received my order today (Tuesday) about 11 am! It must have got shipped out last night! I think this kind of service from you folks is awesome! So, I want to thank Aaron and whoever else was involved in getting this order out so promptly, and just as importantly to thank the spirit demonstrated by the Redmond Perma-Chink folks to support your customers. 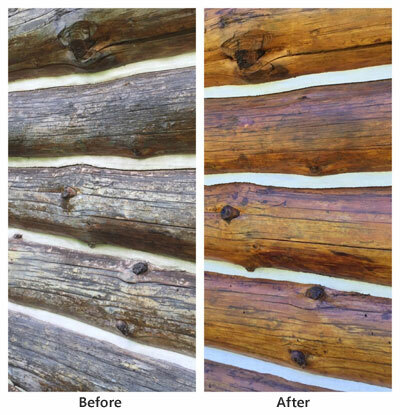 I am 110% impressed and satisfied with our experience using Permachink products while refinishing our log cabin in the Upper Peninsula of Michigan. 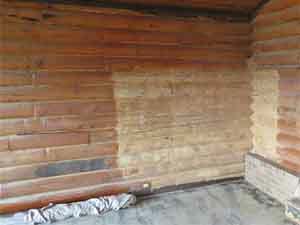 The cabin we inherited had not been maintained in over 30 years and the harsh winters had really taken a toll. During an 8 day summer "vacation", my husband and I alone were able to strip & sand the 3 bedroom cabin, apply Wood Renew, treat with borate, stain with Lifeline Ultra 7, seal with LifeLine Advance Gloss, and paint all of the chinking with Permachink's Chink Paint. I'm not going to lie.... it was a lot of very, very hard work and it took around 192 man-hours to complete (yes, in 8 days with two people), but we were able to do it ourselves exactly as planned. I'm a dentist and my husband works in IT, so it's not like we have a background in this kind of work! Even using these best of the best materials, we saved over $17,000 from the estimates to have it "professionally" done and dare I say I bet it turned out better. We plan on using Permachink materials again next summer when we repair the checks and seals. I wish I could post more than one photo to show you what a husband and wife with no experience were able to do in 8 days. I can't speak highly enough of Permachink. Their products far exceeded my high expectations. Many Thanks, to all of the great folks at Perma Chink, especially Billy & Jimmy! Both gave us plenty of good guidance. 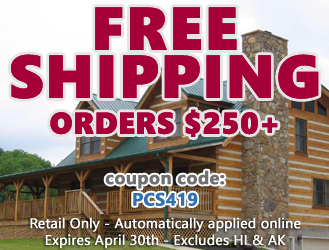 As general contractors and log home refurbishers, a significant aspect of our business is educating log home owners about how to achieve and best maintain the beauty of their home. Whether we are building new homes or refurbishing older log buildings, we want to provide our customers with a beautiful finish for their home that is easy to maintain. 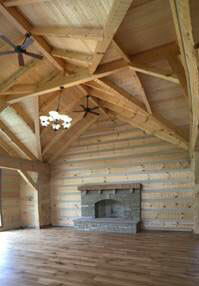 Perma-Chink Systems, Inc. is our go-to source for the most current products for finishing log, timber and cedar homes. Perma-Chink is a great resource, not only for us as professionals, but for our homeowners as well. Our customers are most interested in environmentally-friendly products that are durable as well as beautiful and we know we can count on Perma-Chink for quality products that have been developed using the most current research. 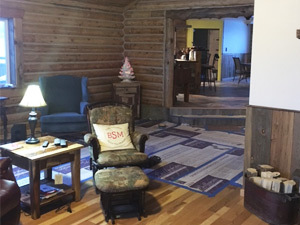 One of our recent customers commented after the complete restoration of her log home, “Our home POPS now!” Using Perma-Chink products gives us the confidence that our customers will be happy with their home for years to come. 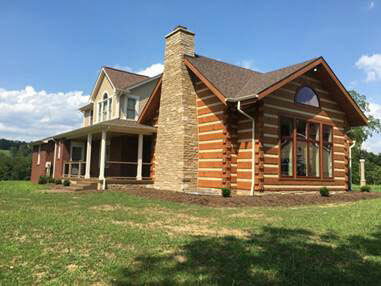 Twin Creeks Log Home Supply, Inc.
“It was hard to make up our minds to switch from competitor’s products to the Perma-Chink products but we are glad that we did. 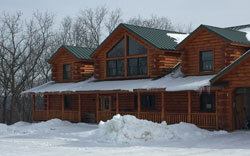 Jim Barna Log & Timber Homes.